Home » Review: Is the Keurig Rivo Worth the Price? Review: Is the Keurig Rivo Worth the Price? As a cappuccino lover, I was very excited to hear about the new Keurig Rivo. 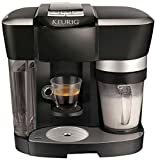 While I’ve always loved the versatility of my Keurig K200, I was delighted to hear that the Rivo is specifically designed for espresso, cappuccino and lattes (all of my favorites). I’m a daily coffee drinker, and I use my K200 regularly, but I’m always happy to add a new machine to my collection, especially one that makes my favorite caffeinated drinks. In this Keurig Rivo review, I’ll see if it offers enough for the price. Bottom Line – Is the Rivo Worth the Ask? If you’re like me, you find that you have to leave the house every time you want to enjoy a quality cappuccino. And that gets annoying. I would much rather brew my own at home—and truly enjoy it. Which is what the Rivo has brought to my life: delicious cappuccinos at home, in my pajamas (no muss, no fuss, no makeup) and I’m saving money in the long run. Competent Pressure: With the Rivo, you get 15 bars of pressure (which is a lot! I feel like I’m a barista!). Quick Brew: The Keurig brews an espresso in just under a minute. Froth at the Same Time: The design of the Rivo allows you to brew an espresso on one side while you froth milk on the other side. Easy to Use: And the machine is simple to use (anyone can do it), as it has just five buttons. It’s easy for me to make my cappuccino even first thing in the morning, before I’ve had my caffeine. Simple to Clean: Cleaning the machine is also easy and quick. I suggest cleaning the frothing pitcher between each use, as it makes for the best frothing experience. Make sure to rinse and dry the pitcher well so that the extra moisture doesn’t ruin your froth. I think the Rivo serves up an outstanding cup of authentic cappuccino (and a perfect latte). With this Keurig, I find that I get a consistent cup of cappuccino from batch to batch, I never have to worry if the cup will be good or not. When I head to Starbuck’s, I’m never sure if my espresso will be as good as the last one. The Rivo’s milk frother works exceptionally well when you take the time to experiment with milk levels. I like a lot of foam, and have found that I need to fill the pitcher to just a hair under the minimum fill line. For a bit less froth, fill the pitcher to just over the minimum fill line. I know everyone’s tastes are different, so I suggest taking some time to experiment and find what works best. With the frother, it’s also important to use low fat milk; the lower the fat content, the better the milk will froth. Once you have put in your desired amount of milk, place the frothing mechanism on top of the cup and slide it into the machine. Then just push a button. 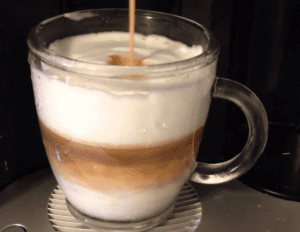 You’ll have your steamed milk in less than two minutes, simply and easily. I also believe that the milk and espresso temperatures are good. For me, the temp is perfect right out of the brewer. I don’t like my coffee really hot, but if you do, you will want to preheat the cup first. Preheating is actually common practice in Italy, so if you prefer an Italian-style cappuccino, preheating may be the option for you. Dual-walled insulated glass cups are perfect for maintaining the perfect temperature of your cappuccino; they are an excellent choice for anyone who likes to sip their drink, like I do. I would also like to point out that the Rivo makes a very good, very drinkable shot of espresso quite quickly. It gives you the choice of four different varieties of espresso, too. The machine makes a fantastic tasting cappuccino or latte within just a few minutes that will rival any of your neighborhood coffee houses. For my money nothing really comes as close as the Rivo to giving you a consistently good quality espresso or cappuccino in your home. 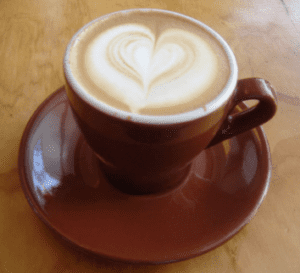 It’s an affordable option (check here for latest pricing) for those who love a good cappuccino, often, like I do! While the Rivo isn’t that impressive sitting on my counter, it is kind of big and bulky, I don’t really care. I don’t love it for its aesthetics, I love it for what it does. 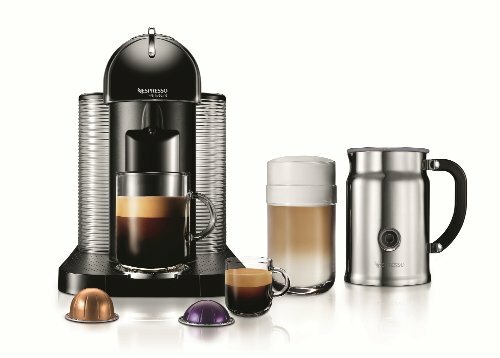 It provides me with an authentic tasting, consistently good cup of espresso or cappuccino in my own home at a very affordable price. I should mention that Keurig has excellent customer service. I have not had a problem with my Rivo, but I have heard of others who had problems with theirs. That being said, those who reported problems said that Keurig replaced their machines immediately with new ones. Brew Sizes 1.4 or 2.8 oz. Only Compatible with One Capsule Type: Note that the Rivo does not use K-Cups, it uses capsules instead (which is why it brews such delicious cappuccinos!). Plus, it uses only Lavazza coffee, which some people may not like, but in my opinion it’s pretty good. Lavazza supplies more than half of all the espresso used in Italy, so it’s not too shabby. Not the World’s Best: The Rivo is good but it’s probably not the greatest cappuccino or espresso you have ever tasted; it’s not going to give you one just like you had on vacation in Italy, but it is darn good. If you’re looking for the best espresso you have ever tasted, this machine is probably not for you. Again, I like it, but I need my cappuccino regularly and love that I no longer have to go out and get it. This great machine is a combination of performance and value. Not Stainless Steel: Another thing that may turn some people off is that the Rivo is made of plastic rather than stainless steel. The machine costs less than $200 (see here for lower prices), so it is to be expected. I do wish the drip tray was metal so that it was more durable, as it is currently painted plastic which may come right off after months of washing. Clearly, there is a giant elephant in the room. Namely, Nespresso and the new Ninja Coffee Bar. The Nespresso is a bit more functional than the Rivo, at least at face value. It can prepare regular coffee AND espresso style drinks. Drawbacks? The VertuoLine IS a bit more expensive typically, but check this listing for the latest pricing. 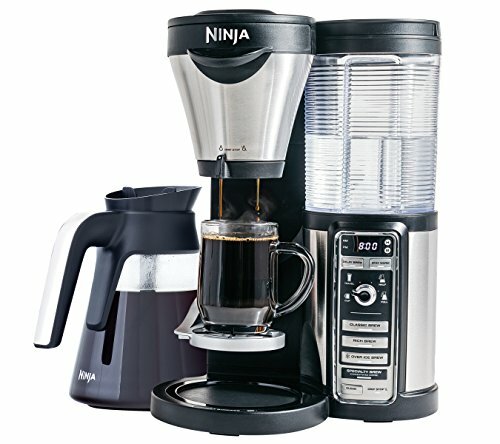 This isn’t really a fair comparison, because the Ninja doesn’t make a “true” espresso. BUT, you can adjust the concentration of the coffee to create an strong base for espresso style drinks. Again, the coffee purists will cringe (and so did I… a bit), but the end result was a fairly good imitation. Also, it’s a more versatile machine that can make all kinds of coffee (with variable concentrations). Drawbacks? It’s not a true espresso brewer. It’s slightly LESS than the Rivo, but check this listing for the latest pricing. 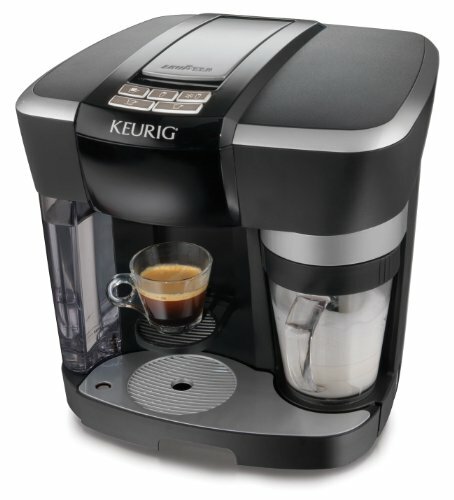 For me, the bottom line is that the Keurig Rivo does what it says at an affordable price. For less than $150 I have a machine that makes me a great cup of cappuccino in my own home. I don’t have to go out and get it (I just have to remember to order more pods so that I don’t run out) and I don’t have to worry about spending big bucks at the local coffee house every week. The pods save me time, money and stress. Remember, a bit of trial and error with the milk will allow you to find the amount of froth that’s right for you (and again, the lower the milk fat, the better). It took me a little bit of time to get it right. The great customer service at Keurig assures me that if my Rivo does ever give me a problem, they will fix it. It’s a no-brainer, if you love cappuccino or espresso and love the idea of making your own, give the Rivo a whirl. Previous Post: « Does the High-End Jura J9 One Touch Coffee Maker Live Up to Expectations?